Trust me. It's just a picture. California-greetings from the whole fam damily!!!!! I have a ton of blog catch-up to do, but for now I just hope that everyone is doing well! First, the stark realization hit that it was 104 degrees at 8:30 at night. BLECH. I nearly hid on the plane so I could take the turn around flight back to San Diego. But no such luck. Second, a text message appeared on my phone. It read: "You get one week until training starts." The reply: "Yo training momma." I repeat: this is NOT a post about running splits. If this had been an actual post about running splits, the blog author would have been in complete violation of the Splitless Summer Edict, and therefore may be subjected to serious harassment. This is only a TEST. Rumor has it that a Pokey Runner, who shall remain unnamed, as been running like blazes in Southern California for the past week. Garmin reports indicate a 10:48 minute mile, which has previously been unheard of, un-thought of, and UNimaginable up until this point. This mile was second in a 3ish mile run, subsequent to an 11:22 split, and then followed by a big freaking hill that just warranted walking. Rumors are circulating that the Pokey Runner was disgustingly sweaty (compliments of SoCal humidity), yet ecstatic after this major running miracle. Again, this is only a TEST of the Split Posting System. Had this been an actual post about running splits, it would have been followed by either a lot of whining and moaning, OR in this case, a lot of hooting and hollering. You can now return to your regularly scheduled Blog Programming. Let me just start by saying that I am so glad it is Friday ~ and that by tomorrow at almost this time, I will be out of the 105 degree temps and back in the cool paradise known as San Diego. Ahhhhh…..I can smell the ocean now. I will be on blog-hiatus for a while as a result ~ other than staying caught up with work issues (sad, I know…it’s supposed to be a vacation), I am also going to be vacationing from the computer somewhat. This morning it finally clicked in my brain as to what an amazing couple weeks it has been for me in the weight loss and fitness arena. I’ve been a little disappointed at my lack of scale-cooperation on the weight loss front, but that all changed this morning with a simple, daily occurrence. Not just in any clothes ~ not comfy weekend shorts and a t-shirt. Not even nice business-casual work clothes that I wear to my office. This morning I put on the most evil, unforgiving piece of clothing ever ~ second only to a swimsuit. I put on a pair of JEANS. Even worse ~ newly washed jeans ~ the worst piece of clothing imaginable for anyone who battles the scale on a regular basis. I was seriously disheartened when I picked up my favorite pair of jeans off the cedar chest in my room, only to find that I had washed them last weekend, and their stretchy, somewhat comfortable feel had been replaced with a stiffer, more unforgiving appearance. DRATS! But resigned to my fate on casual Friday, I donned the jeans. With only one leg in place in the newly washed pants, the shock set in. They felt LOOSE. I put the other leg in, and it confirmed the same phenomenon. When it actually came time to button those bad boys, I thought I had made a mistake. Yes ~ I actually took them off to check the tag to confirm that yes, they were in fact the one pair of jeans I wear on a regular basis (because they were the least evil of all the denim in my closet) ~ and not a pair of my *fat* jeans that might have snuck out of the closet. Yes, these were my old faithfuls ~ the same, yet entirely different. I will say without a moment of hesitation that all my disappointment over the scale disappeared this morning, all from one pair of jeans. Something in my body is changing ~ shrinking, toning…whatever…..but something REALLY good is happening here. I don’t care what the scale says if I can put on a pair of jeans ~ or any clothing for that matter ~ and look and feel as good as I do today. All of us who are trying to lose weight always claim that we don’t really care about the scale, only what we look like and how our clothes fit. Yet, I don’t believe that we really, truly buy into that philosophy until it actually happens for us. I am sooooo going to miss my gym classes while I am gone for the next while, but I’ll keep up the cardio work with regular running. It will just have to do. 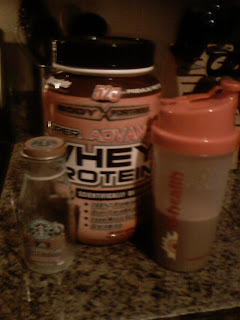 I have also added a new friend to my diet ~ the protein shake. And did you actually know that there is a Starbucks High Protein Frappucino?? Yes, it’s true! I had one this morning. Mocha Frappucino with 32 grams of protein in one serving!!! Who knew? It is the best thing ever for this morning-coffee-addict-turned-protein freak. Where there’s a will, there’s a way. I have outsmarted the protein gods and created my own lovely concoction ~ still complete with skim milk, coffee, and protein all in one neat little bundle. Can you say YUMMMM? Play the song ~ I promise you'll be addicted! Thanks for all the input on nutrition, and especially my protein debacle lately ~ it has all been so incredibly helpful! I am backing down a bit and not worrying about the *target* and just focusing on making a conscious effort to maximize the protein where and when I can. I am also going to add a protein shake to my daily diet and see how it goes. I am sorry I have been so lousy at commenting on blogs lately ~ I am truly reading them all when I get a moment, but just don't have anything wise to say lately. I am swamped at work and soooo ready for vacation. Yesterday I ate, and ate, and ATE…..
And then ate some more…..and I STILL couldn’t hit my protein target for yesterday!!!! I made a conscious effort to try and hit the target, could barely choke down all the protein in a full can of lentil soup (won’t be having that again anytime soon…) and still came up short. If you recall, the target the trainer set for me was 140g per day. Sheesh. I was over my target calories by about 70 calories ~ which is fine with me. The Slim Fast shake was probably too high in calories for just a snack, but I was itching for the 15g of protein that it provided. I know there are other protein shakes I should be having ~ I just have to get to the store and figure that part out. The good news today is that my scale was nice to me this morning and had me down just a smidge ~ about a pound and a half. I’ll take it ~ a loss is a loss! I am hoping this week proves to be successful in the weight department! I skipped my workout last night ~ and was even too tired to mentally beat myself up for it. I didn’t get home until almost 9am (after a day of work, dinner with some friends so my kids could see their kids before leaving again on Saturday) ~ so I got the boys to bed and all the lights were out by 9:20pm. I was too exhausted to even think about Tae Bo. So my parting question for today (and I know some of this was mentioned in some comments a few posts ago) is for anyone who utilizes protein shakes as part of their daily nutrition: What kind do you use and why? Do you know (off the top of your head) how many calories and grams of protein it has? So quick recap of my weekend, and then I have to get some work done. Overall, I would call it a successful weekend with exercise and food choices ~ even while out of my usual routine. Last Thursday was a rest day as planned; and I had short runs on both Friday and Saturday mornings; Sunday was rest again as the schedule just didn’t permit a morning run. Runs both days were 3 miles – with Saturday’s run being not quite as great Friday's run that I didn’t post about. There are some BIG hills in the area of Carlsbad where we are staying ~ so I took Saturday’s run as more of a hill-workout than anything else. And of course, since it is a splitless summer, I can’t allow myself to post any times. I know you all understand. My food choices were decent ~ if not good ~ during the entire weekend, with the exception of Sunday. I splurged a bit, totally on purpose, and am okay with it. My good-choice days even included a dinner at Ruth Chris’s steakhouse (for the Hubs and my anniversary which is today. Awwwww…..) and a Padres baseball game ~ which is junk food haven for me. So all things considered, the weekend was a success. The only area of my whole fitness-quest that is disappointing me is the scale. Since I was in Carlsbad with no scale of my own, I emailed Viv for the Weight Loss Challenge and just told her to hold me at my starting weight. I figured I would make up for it later. I am going to give calorie-counting a continued try this week ~ sticking to my plan like glue ~ with 5 straight days of working out ~ and see what happens. The difficulty will come when I leave for CA again on Saturday, and my schedule gets all crazy. But I’m confident that with scheduled running and good food choices, I can make it work for the next couple weeks. After all, this is my LIFESTYLE CHANGE ~ not just a short term diet. Eating right and exercise are going to become part of who I am. The weight loss will inevitably follow. First off, I feel absolutely FANTASTIC! I have been doing the *small meal deal* throughout the day ~ eating approximately every 3 hours like trainer woman instructed ~ and I haven’t been hungry one bit. On top of that, I have a lot of energy, which is the real bonus! So something is working internally ~ at least regarding the way my body seems to process this new schedule. The only downside so far is that the scale hasn’t budged :( Well ~ okay, maybe some fluctuation between a pound or half a pound down from the weekend ~ but nothing to knock my socks off. I have been working out like a FIEND for the past week and a half, yet my scale refuses to acknowledge this. I know, I KNOW that some of it may have to do with muscle building, which I really feel is going on right now. My body just feels better, and yet I know it just takes time for everything to adjust. I can’t say that I’m not a wee bit disappointed (after all I told my trusty counterpart Viv that I was going to kick her tail in the Weight Loss Challenge), but I have no plans to change anything anytime soon. I am going to keep on keeping on ~ and hope the scale will end up in my favor. Last night was Body Attack again with my good friend Elaine, and I just can’t keep saying enough good things about this class. It kicks my tail, but I *LOVE* it!!! It is surely going to remain a regular on my workout schedule!!! a) Yes, I checked out both SparkPeople and the Daily Plate….and will probably sign up with one of those if I continue this calorie method. I’ve decided to give it a couple weeks (except when I am traveling, when I will most likely revert to points out of convenience) and then make a decision on my plan of attack for the rest of the summer. c) Thanks for the snack ideas!! It is always good to have more options. Lately my snacks have been cottage cheese with fruit; a lowfat string cheese with a piece of fruit; a Fiber One bar and a yogurt….and a few other combos that I cant remember right now. d) Protein. What can I say? It seems like we all agree that we need more of this in our diet. In my opinion, I think this is one of the areas where WW may fall short. High-protein items are usually higher in calories, and sometimes fat ~ so they end up costing WWers a lot of points ~ and are sometimes avoided as a result. That’s just been my personal experience, at least. e) Teacherwoman asked me for some clarification on the nutrition *equation* so I’ll try to relay it the best I can. Basically, I was told that you need (on a daily basis) 1g of protein, and 1g of carbohydrate for every pound of body weight. For me, with a goal weight of 140 pounds, this equals 140g of protein and 140g of carb per day. Fat grams, for just about everyone regardless of weight, should stay below 30-35g ~ simply because that is deemed a *healthy* level. I don’t have the numbers in front of me right now, but then those figures (140g protein, 140g carb and 30g fat) all have a calorie content (I’m sure you could google it and find out the calorie value of 1 carb, 1 protein and 1 fat…and then do the math). Those totals are what make up the total calorie target for the day ~ which for me is at 1420 right now. It is all derived from the protein/carb/fat breakdown that is suitable for your body weight. Hope this makes sense! I am hoping that I will at least earn a degree in Nutrition after all this is said and done ~ it certainly is an interesting science! The key for me right now is calorie monitoring and exercise. Only good things can come from that eventually, right?? My brain has been in a bit of overload mode since my meeting with the trainer on Monday ~ all this nutrition and exercise stuff can get very complicated, very fast! I am no stranger to Weight Watchers ~ I know how to do it and I know that it works. Well, it has worked for me in the past. It worked great when I had 35 pounds to lose a few years ago ~ and it stopped working as well after I lost a majority of the weight. WW got me to the lowest weight of 149, and that was about 2 years ago. I remember that the drop from 155 to 149 took FOREVER!! So now, at 159 pounds I am almost at the same starting point. I have been somewhat following WW for the past while, and have dropped about 4 pounds. The last couple weeks though, I have been stalled at the 159-160 mark. So I know I need something to mix it up a bit. This is what the trainer has advised for me ~ 1420 calories per day, with a target goal of 140g of protein, 140g of carbs and less than 30-35g of fat. If you are anything like me, I almost flipped at the 140g of daily protein!!!! I think that’s a lot. But, like anything ~ it’s a target to shoot for. Apparently the breakdown is based on your body weight ~ healthy weight loss nutrition indicates that you should eat 1g of protein and 1g of carb for every pound of body weight ~ and my trainer used my goal weight of 140 to compute my specific daily totals. In addition, trainer woman says that I should be eating 6-8 times a day (and apparently Hershey kisses don’t count here), and that every time I eat a meal or snack it should have ALL the nutritional components present. Translated: every time you put food in your mouth, make sure it has protein, carb and fat. Easy as pie, right? Not so much. This has taking a lot of planning and though on my part over the past couple days to try and make this thing work. Yesterday I stuck to the plan like glue, and was actually struggling last night to make sure I ate all my calories. And the funny thing ~ I wasn’t the least bit hungry. So I am giving this calorie-counting thing a try for now, and see how it works. Again, the trainer reaffirmed for me that nutrition is 80% of the weight loss battle; exercise is the small remaining 20%. The best part of all of this is that I feel totally committed. I am committed to making a change this summer, and the end result will be a healthier, more fit Pokey. By the time I run my next half marathon this fall, I AM going to be at least 10 pounds lighter and have a lot less body fat to lug around!! It's always wonderful to go for an assessment with the trainer at the gym and learn that your body is made up of a third of FAT. That's not a typo, peeps. A THIRD....you read me? Ok, that's just gross. 50ish pounds of FAT. Ewwwwww. GREAT. So my focus should be on body fat reduction...blah blah....not necessarily pounds....yada yada.....OK, fine and dandy. Either way you slice it, it all means I have a lot of work to do. Trainer (whom I haven't formally hired, but is included once a month with my gym membership) says I can have this done by September 14th AND be at my goal weight of 140 pounds. Yeah, you're right ~ I think she smokes crack too. OKAY. I'M.DONE. This concludes the Body Fat Rant for today. Don't worry, I'm sure there will be another one in the line up coming soon. 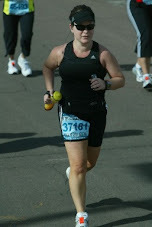 Let's talk about something I'm happy with for now ~ my running!!! 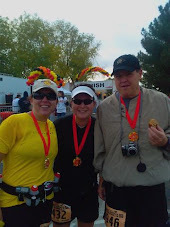 Got 5 miles done on Saturday ~ a good run. Got 3 miles done this morning ~ a crappy run. There is absolutely no logic to this sport whatsoever. But I'm moving, and that is what matters. And I've officially declared next few months as the SPLITLESS SUMMER ~ which means that I won't be pressuring myself during my runs about how fast or not fast I am running ~ and I won't be posting any splits on my blog. (Unless of course, they are FANTABULOUS un-Pokey-like splits that just SCREAM to be posted. As the blog author, I'm allowed to have a double standard like this, and can post splits or not post splits at my sole and separate discretion.) See why it's always important to read the fine print?? So running for pure cardio benefit is what is on the game plan. I did well last week with all my workouts ~ hit every target except Sunday, which just simply warranted a rest. Today will be a double workout day with a run this morning, and a Body Pump class tonight. SUH-WEET!!! Me and my body fat are going to get our nails done now. There has to be a highlight of this day buried in here somewhere!!! !